Be the first to share your favorite memory, photo or story of Gilda. This memorial page is dedicated for family, friends and future generations to celebrate the life of their loved one. 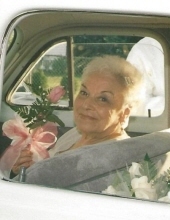 Gilda F. (Giovanello) Marrese, 97, passed away Sunday, March 31, 2019 at the Life Care Center in West Bridgewater after a period of failing health. Gilda was born to Virgilio and Clara Giovanello on February 14, 1922 in Petruro, Italy, September 1930 she immigrated to America with her mother, Clara and brother, Dominic to be with her father in Brockton. She attended Brockton High School from 1937 to 1940. Gilda left high school to help with the family business as so many in that generation did. Later she completed her high school education by attending night school. Gilda was the devoted wife to Andrew Marrese of Brockton. They were married on September 17, 1950. Andrew was a naval veteran of World War II who had participated in many battles of the South Pacific. The two were married until April 1991 when Andrew passed away. They lived most of their married life in the city of Brockton, where they raised their four children Gary, Denis, Cindy and Joni. In 1950, Gilda started a business on Main Street in Brockton called the Jewel Box. She experienced success with the business but decided the importance of family would require all her time and energy. While raising her four children she volunteered and helped parents whose children had special needs. In 1965, Gilda became one of the founders and driving forces for the organization BAARC and Chairman of the main fund raiser, the Chrysanthemum Ball. An event that she organized to help raise funds to help support parents with children of special needs. The Chrysanthemum Ball became the biggest and one of the most well-known events of its time. Gilda stayed active with BAARC until the 1980’s where her role changed to become more hands on working with the children. BAARC is still in existence under the name of The ARC, a multi-service agency. Gilda was a loving wife, mother, grandmother and auntie. She deeply cherished the time she spent with all her family and friends. Gilda is survived by her four children, Gary, Denis and his wife Claudia of Mansfield, Cindy Lahlum and her husband Arthur of Camano Island, WA , Joni Lahlum and her husband Gilbert of Mansfield; her three grandchildren, Andrea, Anthony and Santino. She is also survived by her sister-in-laws Helen Marrese, Barbara Marrese, Evelyn Giovanello. She was predeceased by her husband Andrew Marrese, brother, Dominic Giovanello, her sisters Eda (Giovanello) Robohm, Nina (Giovanello) O’Donnell; her sister-in-law Theresa Marrese; and her brother-in-laws, Tony Marrese, Albert Marrese, Edward Marrese and Henry Robohm. Gilda made Bridgewater her home for the last 33 years where she enjoyed her time spent with family and friends. A funeral service will be held on Saturday, April 6th at 1:00PM in the Russell & Pica Funeral Home, 165 Belmont St.,(Rt.123) Brockton. Interment will be on MONDAY, April 8th at 1:30PM in the VA Massachusetts National Cemetery, Bourne. Calling hours will be prior to the service on Saturday from 11:00AM to 1:00PM. "Email Address" would like to share the life celebration of Gilda F. (Giovanello) Marrese. Click on the "link" to go to share a favorite memory or leave a condolence message for the family.